Compare the merits of investing today in Coke versus Starbucks, and learn what "Nokotta!" means along the way. Image sources: The Coca-Cola Corporation and Starbucks Corporation. This is the most difficult sumo bout I have ever had to referee. My apologies to fans of Ford Madox Ford for mangling his most famous sentence.And I'm aware that the sumo metaphor isn't entirely original, either. Yet as we pit two of the most venerated consumer-goods companies against each other, Coca-Cola Co. (NYSE:KO) and Starbucks Corporation (NASDAQ:SBUX), we set up nothing less than an epic wrestling contest between two stocks I believe every long-term investor should keep in his or her portfolio. Holding either of these equities over the past decade would have produced extremely gratifying returns. In the 10-year period from the beginning of September 2006 to the end of August 2016, Coca-Cola generated a total return of 158% for its shareholders. Starbucks beat that performance by 131 percentage points, for a spectacular total return of 289%. Will this differential continue going forward? I now wave the sumo umpire's gunbai, or ceremonial wooden flag, in the victor's direction: Over the next 10 years, current fortunes will reverse, and Coca-Cola will handily outperform Starbucks on a total return basis. On what planet am I living, you ask? Indeed. 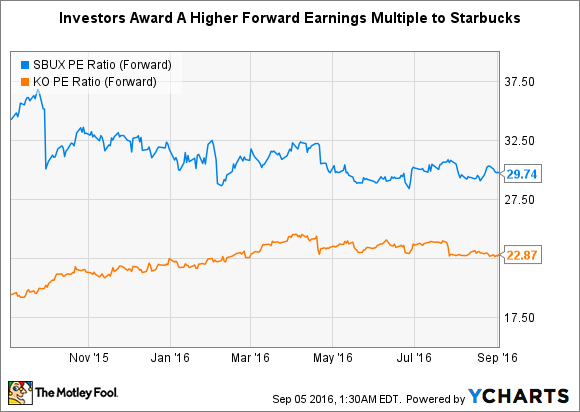 From the perspective of September 2016, it certainly appears that Starbucks is the better buy. Aside from a rare comparable-sales stumble last quarter, when it killed a 25-quarter streak of posting U.S. comps above 5%, Starbucks has executed on seemingly every front as it chases a five-year goal to grow annual revenue to $30 billion by 2019. Coca-Cola, on the other hand, faces a possible wave of local consumption taxes on carbonated soft drinks, akin to those recently enacted in Philadelphia and Berkeley. Worse, South Africa is considering a nationwide tax of 20% on sweetened beverages, which may be effected as early as next April. Soda weakness in general has harried the quarterly results coming out of Atlanta. Though Coca-Cola's overall volumes and organic growth are still advancing modestly, the corporation's reported revenue has declined 4% over the past 12 months. Data source: Company SEC filings, and analyst conference call transcripts. Tables by author. Of all the points listed for either company, one has the distinction of being more consequential than the rest: Coke's decision to sell off its bottling operations to franchised bottlers and joint-venture partners. As I discussed in an article earlier this year, Coke is moving to a "capital light" business model and is rushing to refranchise nearly 100% of its bottling operations by the end of 2017. When these divestments are complete, the company will have shrunk drastically in terms of employees and revenue. Thanks to a widely noted presentation from earlier this year, we have a few hypothetical data points with which to map these changes, courtesy of Kathy Waller, Coca-Cola's CFO. Waller recast the beverage giant's 2015 profit-and-loss statement as if all bottling refranchising efforts were already finalized. In this scenario, instead of $44.3 billion in revenue, Coke would have booked just $28.5 billion. Data source: author's calculations based on Coca-Cola and Starbucks' SEC filings, conference call transcripts, and press releases. Quite dramatic, isn't it? But don't feel sorry for Coke just yet, as this is the point where I dramatically shout "Nokotta!" -- indicating that the refreshment titan is still within the ring and may continue fighting. Coca-Cola's remaining business lines post-refranchising will be quite profitable, and per Waller, operating margin is set to scale an extension ladder, from an already handsome 23%, to 34%. By 2019, Starbucks is likely to have lifted its own operating margin another couple of percentage points above the current level of 19%. A focus on higher end coffees through the launching of additional Starbucks "Roastery" stores, operating leverage from digital investments, and the company's recently purchased equity stake in high-end Italian bakery Princi are each decent examples of Starbucks' profit improvement opportunities. If we apply a 21% operating margin to Starbucks' $30 billion target, then the company will generate $6.3 billion in operating income in 2019, but this will barely equal the margin Coca-Cola produces today. By continuing to manufacture lucrative concentrates and syrups, and by licensing out its portfolio of 500 brands for bottled distribution, Coke is going to end up a more diminutive company, but with even better profit and cash generation capability than it boasts currently. In contrast, over the next 10 years, despite greater presence on grocery aisle shelves, additional joint ventures with bottling partners such as PepsiCo and Anheuser-Busch InBev, and a steady dose of international franchising, Starbucks will still rely heavily on capital-intensive, company-owned stores to make its living. As of its most recently reported quarter, Starbucks owned 51% of the roughly 24,400 stores that carried its trademarks. For all the revenue improvement to come, Starbucks still has to maintain and periodically renovate a hefty share of its global store base -- the kind of capital commitment Coca-Cola has just walked away from. The trend lines in the preceding revenue chart aren't meant to suggest a permanent condition or ultimate destiny. At some point after 2019, and maybe sooner, Starbucks will most likely encounter difficulty maintaining the 11%-plus revenue compounded annual growth rate, or CAGR, that it's posted over the past five years. When a corporation's top line falls in the tens of billions, this type of revenue hurdle becomes a more complex undertaking with each passing year. In fact, some would argue that such growth fatigue is already manifest. If we remove the $1.1 billion in incremental revenue Starbucks gained from its purchase of Starbucks Japan in 2015, the organization's true growth rate last year was closer to 9.8%. Through three quarters of the current fiscal year, Starbucks has posted roughly 9.5% growth, marking seven quarters below the longer-term trend. Conversely, as Coca-Cola shifts its portfolio toward still (i.e., non-sparkling) beverages, while focusing on licensing over manufacturing, it should be able to post a CAGR in the mid-single digits. This would equal a modest two- to three-percentage-point outpacing of the recent 4% annual expansion rate of the global beverage market. As Starbucks' revenue CAGR ebbs, it's conceivable that the two beverage corporations' respective growth rates will come to parity in the 6%-7% range within the coming 10-year period. So, given the potential outcomes covered here, why aren't shares of Coca-Cola beginning to coast upward? Actually, they are. Over the past 12 months, Coca-Cola shares have produced a total return of 17% for shareholders, versus 5% for Starbucks investors. Theoretically, the "KO" ticker could trade at even higher levels than at present. But the market is reluctant to price in a higher multiple for Coca-Cola until it finishes refranchising and proves out its margin projections. More pointedly, it seems that the utter transformation of Coca-Cola's business model is an overlooked narrative in the marketplace, because of legitimate hand-wringing over near-term pressures on its carbonated soft-drink sales. Like the revenue CAGRs, I believe these earnings multiples will move toward parity within the next decade. Before concluding, I want to state frankly that one can hardly go wrong buying Starbucks. It's run by a world-class management team, sells an addictive product, and continues to find ways to dominate the retail coffee business. Its greatest threat is probably the effect on consumers of potential global economic deceleration. That's one thing that Starbucks executives don't have much control over, and it may be the only factor, besides occasional over-consumption of caffeine, that impedes their sleep. But in each contest there must be a victor. Hikiwake, the instance of a draw, is hardly ever seen in contemporary sumo, and even more rarely in the global beverage business. Advantage to Coke; see you in the stands at the next match.